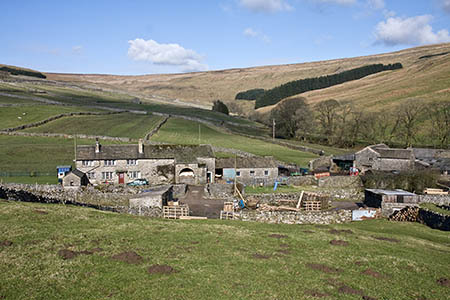 The walk up the least lofty of the Yorkshire Three Peaks starts from the remote hamlet of Foxup, the end of the metalled road up Littondale, named after its main village rather than the river, the Skirfare, which flows down it. There are spaces to park a couple of cars at the roadside by the farmhouse. On our visit we were greeted by a very friendly border collie who insisted on sitting on our boots as we tried to lace them up. Take the bridleway from the fold opposite the bridge and rise up the hill to a gate. Then head diagonally up the hill to a gate in the wall on the right. Go through the gate and follow the green track ahead which then bears left. 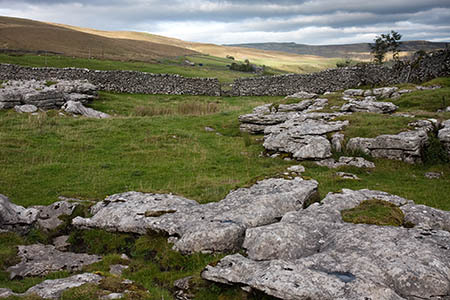 This is the old drove road, believed to be mediaeval in origin with links to a route to Fountains Abbey, linking Horton in Ribblesdale with Foxup. After passing through the next gate, the track turns left, running alongside the wall. The wall changes direction to the right, and the track then leaves the wall to contour along the southern flanks of the valley containing Foxup Beck below. After a second gate, the bridleway heads diagonally uphill to the left, marked by a finger post. Don’t take the path heading straight on. If you do, you can correct the mistake by climbing over the next gate and then heading up the wall side to meet the Foxup Road again. The bridleway levels out again, becoming more of a single track in parts. After another two gates, keep your eyes peeled 100m beyond for the finger post marking the path upwards on the left to Plover Hill. 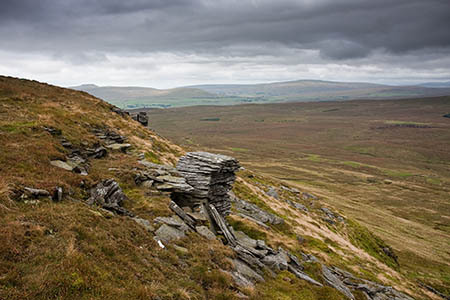 Pause to take in views (unless the clag is down) of Ingleborough straight ahead and Whernside to the right, then gird your loins for the 190m climb up to the summit of Plover Hill. Slog up the grassy path, boggy in parts, then over a broken wall before the path bears left up a grassy break in the limestone outcrops. The stepped path peters out as the gradient eases on to the summit plateau of the hill. Continue diagonally right away from the wall on the left, following the path across the grassy summit to a solitary pole, which marks the route to a ladder stile. Hop over the stile and keep the wall to your left as you cross a boggy section. The driest route is well away from the wall, making a beeline for the wall corner ahead where it starts to head south towards Pen-y-ghent’s lumbering bulk. In poor visibility the feint path is easily lost in the boggy section. If in doubt, use the wall on the left as a handrail, but be prepared for a wetter route there. 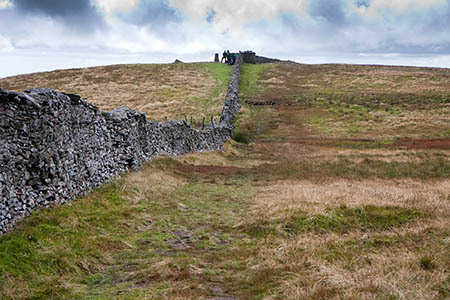 As the wall heads south, there is a broad col before the route starts a short climb finally to Pen-y-ghent’s summit. On a clear day, Morecambe Bay is visible out to the West. The summit is marked by a finger post, a shelter seat on each side of the wall so you can get out of the prevailing wind and, on the eastern side a trig pillar. Cross the stile to the trig pillar side and prepare for the descent. Fountains Fell, so named because it was owned by the monks of Fountains Abbey, looms to the east, across the road through Silverdale. 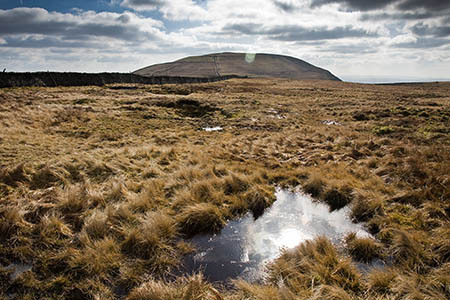 Leave the summit by the Pennine Way heading south. The maintained path soon reaches the steepest section of the route as it passes through the gritstone escarpment. There’s a scrambly section that necessitates the use of hands as well as feet and the path then zigzags slightly until it meets the limestone of the next escarpment. Care is needed, especially in the wet, as you make your way down the stepped layers of stone, finally meeting the Brackenbottom path on the right at a gate in the wall. 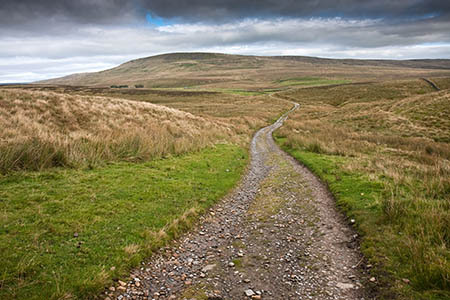 Don’t take the Brackenbottom path, but carry straight on along the Pennine Way. Cross the next wall by the through-stones stile and then continue down, over a short boardwalk section then to the large shake hole of Churn Milk Hole. At Churn Milk Hole, take the byway to the left, following the finger post directing you along the Pennine Way. Pass Dale Head farm on the right to reach the minor road through Silverdale. Turn left along the road, which is followed for 1.4km. Just before a cattle grid where the Pennine Way heads up to Fountains Fell on the right, a small stile give access to a barely visible path down the south-western side of the little gill leading towards Blishmire House, a barn a couple of hundred metres down. Keep the beck on your right, crossing the next wall by a stile then after 40m cross the stile in the wall to the right, signposted Silverdale Road. This leg can more easily be accomplished by walking down the track on the north-eastern side of the little gill, though this is technically a trespass. Join the path leading to the right which runs parallel to the Silverdale Road. Walk across the field and use the stile to cross the fence, then use a gate at the next wall, after which follow the path slightly to the left, keeping the wall to the left. Cross the road then keep the wall to the right, to reach a stile at a gap in the wall near the Giant’s Grave. The name relates to a Neolithic burial barrow close to the path. Keep the wall then fence to the left, then pick up the path through an open field, to cross a stream, sometimes dry – we’re in limestone country – which leads down a gorge. Carry on straight ahead and continue on the path parallel to the beck, which can be seen descending into the deep gorge of Pen-y-ghent Gill. Pass below the farm buildings at Pen-y-ghent House. Across the valley here is a strange phenomenon. 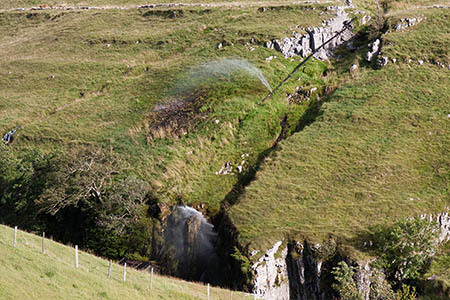 Two ruptures in the water pipe descending from Fountains Fell spray water metres into the air. When we passed this way 2½ years ago, there was one ‘fountain’ spraying sideways into the subsidiary gill. Now a second one sends water skywards from a second breach in the pipe. Perhaps in years to come this unnatural spectacle will become a tourist draw in its own right. The path continues to contour high above the beck for another 1.5km before finally climbing to the left to a gate, which then leads shortly to the Silverdale Road once more. Turn right and follow the road, which is thankfully usually quiet, for another 800m until, a cattle grid. Immediately after the grid, take the bridleway bearing left and follow it as it heads north above the village of Halton Gill. Pass through a gate then continue on the green track, with a wall joining from the right. Another gate leads into the large field encountered at the beginning of the walk. Continue downhill to the hamlet of Foxup. Ordnance Survey mapping and route data for this walk can be found on our grough route system. Key in GR-Pen-2013 to the keyword search. Note: grough’s routes should be used in conjunction with maps, a compass and other navigational aids. Routes often use access land and involve finding your route off footpaths. Knowledge of and competence in using a map and compass is essential when using the routes. Carry the correct equipment for the conditions and be aware of hazards in the outdoor and upland environment.